What are the reasons for not being able to get a chlorine reading in your pool water? 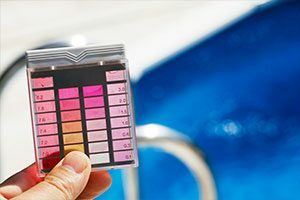 If you test your pool water and can’t get a chlorine level reading at all it may be due to a very high chlorine demand. A high chlorine demand is the inability to keep an adequate level of chlorine in the pool water even though the water appears to be balanced and properly maintained. That means that oxidation levels have increased to a point where chlorine is being consumed faster than it can be put in to the water by either shocking or normal applications. Contamination, low pH or low chlorine stabiliser levels could cause this situation. The water might appear cloudy, the pool walls be slimy or the pool may look relatively OK.
What might have caused that high chlorine demand in your pool? There are quite a few possible causes for your pool to develop an excessive chlorine demand. You might have an infestation of algae, fungus or bacteria that can deplete normal chlorine levels and it is possible for this to occur without many visible signs. Another possibility is nitrogen contamination, which would produce a high level of chloramines, which then require far larger than normal amounts of chlorine for oxidation. If the high chlorine demand occurs when you are opening the pool after winter, it may be that a combination of debris, contaminants and algae have developed in the pool over the closed season and that this is the cause. In the summer months it’s possible that a high bather load, perhaps over a couple of days has caused the situation. What should I do if I can’t get a chlorine reading? If you’re pool water test kit can’t give you a chlorine reading, the best thing to do is to get your pool professional or pool service engineer to conduct a chlorine demand test. In some circumstances it’s possible that the chlorine level in your pool is so high that it is bleaching the reagent in your test kit, so having a professional test the water is really the most sensible option and that will tell you which course of action to take. If you need to break the chlorine demand cycle then you will have to first test and adjust the pH levels and then shock the pool with 2 to 3lbs of shock per 10,000 gallons. Circulate the water and then test again. The chlorine demand test should give you an idea of how much shock will eventually need adding to the pool and if this is excessively high you may have to consider partially draining the pool and refilling. If you have a problem with your pool and you’d like help in contacting a pool professional in your area in order to discuss the options in more depth and how they suit your specific circumstances, then there is a find a supplier link at the top of this article that will get the process started.